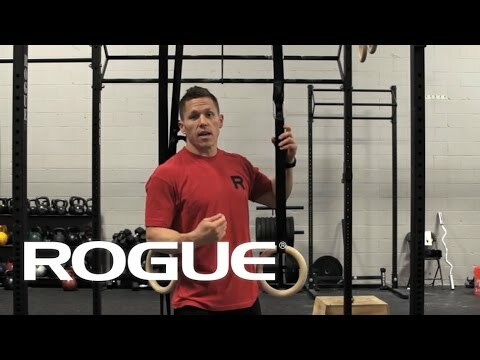 Rogue's Wood Gymnastic Rings offer athletes a texture, grip, and light feel thoroughly distinct from that of steel or plastic rings. Manufactured in Ohio, these rings hark back to the classic American wood gym rings of the past, while still integrating easily into any modern home gym or strength training facility. Each set of wooden rings comes with Rogue’s heavy-duty black nylon ring straps and buckle system, enabling quick, easy adjustments. Hang the ring straps from a crossmember in your gym or venture outdoors to use a swingset or stable tree branch as a foundation. Adaptability, portability, and reliability all help set Rogue Gymnastic Wood Rings apart. Used in the last three CrossFit Games, Rogue Wood Rings are built to handle Olympic caliber ring dips, muscle-ups, back levers, front levers, pull-ups, scarecrows, ring push ups, ring rows, skin the cats, ice cream makers, and anything else you can throw at them. Rogue Wood Rings are designed for indoor or outdoor use when weather permits. Wood rings should never be stored outdoors or used in the rain. This wood item carries a 2 year warranty. Ring Straps are a consumable product and carry a 1 year warranty. Rogue Gymnastic Wood Rings is rated 4.9 out of 5 by 39.